Some odor is expected from a captive turtle, but his enclosure should not have a strong smell. A smelly tank can be a sign of overfeeding, inadequate filtration or poor feeding practices. Tank size, filtration and feeding practices are key to maintaining a low-odor habitat. Turtles need variety in their diet. It is never enough to rely only on prepared turtle food. While commercial turtle pellets and sticks break down slowly and won't spoil as rapidly as fresh foods, you will need to supplement your turtle's diet with a variety of fresh food. If your turtle is an herbivore, he will need a wide assortment of fresh vegetables and fruits, such as cantaloupe and lettuce. These fresh foods can spoil quickly and cloud the water, so feed only what your turtle can consume in a 15- to 20-minute period. Leaving uneaten food in a tank can cause the water to smell and can compromise the health of your turtle. If your turtle is a carnivore, he will need a high-protein diet of live or fresh thawed foods such as mealworms and minnows. These can rapidly spoil and cause odor if left too long. Your omnivore turtle will need a mixture of both. Bigger tanks are better; smaller tanks have greater potential for odor. You can start with a smaller 20-gallon tank and suitable filter, but you will need to upgrade both the tank and the filtration system later. Starting big saves money in the long run. A larger tank is easier to take care of. The water in the larger space will stay cleaner than in a smaller one. Your turtle’s tank needs an adequate filtration system. If your filtration system is too weak for the size tank you own, it will be unable to effectively filter out the waste. Just as you should think big when it comes to your turtle’s tank, think big when it comes to your filtration system. While turtles are not as sensitive to bad water quality as fish, they excrete more waste. A poorly filtered tank will smell, particularly if you are feeding your turtle large amounts of fresh foods. Make sure you use a charcoal insert with your filter, as this will greatly cut back on odors. Turtle tanks need regularly cleaning. You will have to do regular water changes and wipe down the sides of the tank to remove excess algae growth. Dispose of and replace 20 percent to 30 percent of the aquarium water every two to three weeks. You may need to change the water more frequently if your tank houses more than two turtles or if you notice odor. You should use a gravel vacuum to siphon waste and debris stuck in the gravel. Remove all uneaten fresh and prepared foods if your turtle has not consumed them in 15 to 20 minutes. 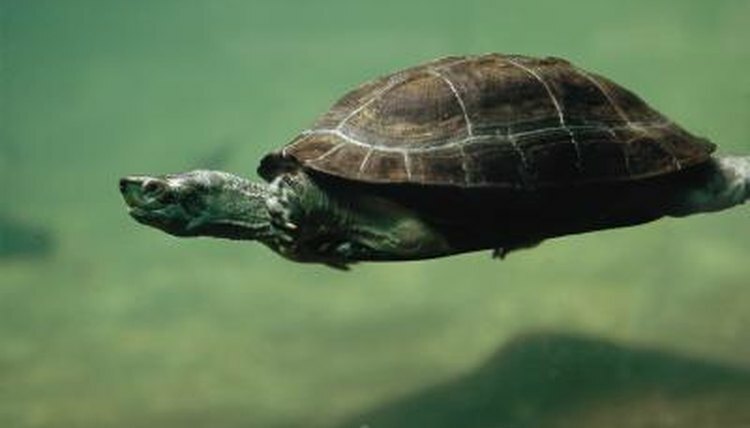 According to Austin's Turtle Page, in the wild turtles are opportunistic feeders, meaning they will eat when they can. In captivity your turtle may eat as often as you try to feed him. He will always respond hungrily to the sight of food. Feed your turtle at set times to help him adjust to regular meals. Instead of feeding your turtle in his main tank, let him "dine out" for his meals: Remove your turtle at feeding time and place him in a designated feeding tub with enough water to cover the top of his shell. Leave him in there with his food, and give him time to eat and use the bathroom. Many turtles excrete waste immediately after eating. A strong odor coming from your turtle's tank could be an indicator of a health issue. Taking your turtle out at feeding time will give you a chance to examine him and to make sure he looks and acts healthy. Discharge or a foul odor indicates he may have a bacterial or fungal infection called shell rot. Shell rot usually begins with an injury -- even a minor one such as a scratch -- and is exacerbated by poor water quality. Check your turtle at least once a week for any signs of infection or injury. What Foods Do Sideneck Turtles Love? How Much Water Do Red-Eared Turtles Needs?